Squeeze a small portion of Aeropuffing LED Gel Paste onto the metallic palette and add a tiny amount of dry pigment. Stir the pigment and Gel Paste with a brush to obtain a uniform shade. 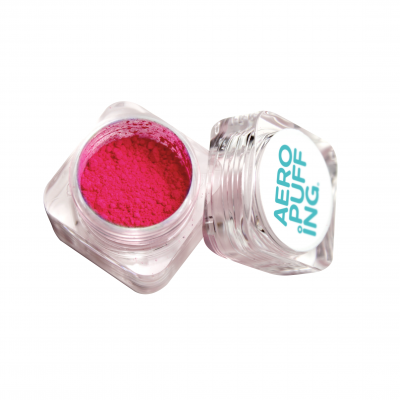 The more pigment you add, the more intense the color of the Gel Paste becomes. When you add the dry pigment to a white LED Gel Paste – the result will be the pastel shade . In a similar way, you can mix dry pigment and Aeropuffing No Cleanse LED Gel Top Coat and Aeropuffing No Cleanse Matte LED Gel Top Coat to get colored, transparent topcoats. Dry pigment can be added to gel polish to get new shades: thus, having a small palette of gel polishes, you can create more than 100 new shades. In a similar way, you can add dry pigment to a classic gel or acrylic, creating new shades of your products for nail enhancement. WARNING: always mix dry pigment with the product on a metallic palette. Never add pigment to the tube/ bottle/ jar, as this may lead to premature polymerization of the product or its clumping.